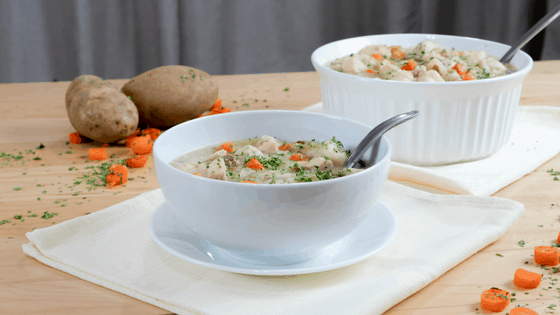 This quick and easy Chicken & Dumplings recipe is made using the Instant Pot (slow cooker). The veggies melt in your mouth and the chicken is soft and moist. Making this Instant Pot Chicken & Dumplings recipe is so simple. After dicing the veggies and cubing the chicken, you just dump it all into the pot along with the seasonings and broth. Set your Instant Pot to poultry and adjust the timer to 15 minutes. After the timer has gone off, apply the quick release on the Instant Pot. Let the pressure release and then remove lid once safe to do so. Press saute on the Instant Pot, add in rolled biscuits and cook for about 5-10 minutes. While the dumplings are cooking, stir them in the pot to ensure they are being cooked evenly and to let the juices soak into the dumplings. When I don’t have a lot of time I use refrigerated biscuits. I roll roughly 8 small biscuits out of each biscuit in the can. Because they plump up while the dumplings are sauteing, larger biscuits will make the dumplings rather large. After the timer has gone off, apply the quick release on the Instant Pot. Remove lid once safe to do so, press saute on the Instant Pot, add in rolled biscuits and cook for about 5-10 minutes. As a result, this recipe is a moist, delicious, and flavorful hearty meal that your family will love. Due to the simplicity of this meal, it’s certainly a regular in rotation in our home. You just can’t beat a meal that tastes this good and that is so quick to make! Not sure about the Instant Pot? Check out my review here. Add 2 tbsp butter to Instant Pot. Lay cubed chicken breasts in Instant Pot and pour chicken stock over top of it. Pour in carrots, celery, onion, and potatoes. Top with poultry seasoning, onion powder, garlic powder, salt, and pepper. Use a spoon to mix. Place lid on Instant Pot and select poultry setting and adjust to 15 minutes. Meanwhile, cut biscuits and roll into balls. Quick release Instant Pot and turn setting to saute. Add in balled biscuits and stir frequently for about 10 minutes. This looks pretty easy to make! Love it! I’ll give it a try soon! Such a quick way to prepare dinner! Love it. I have a slow cooker but think it may be time to switch it out for an Insta pot! Ahhh using biscuits looks so much easier than trying to make them by hand! Never thought of that haha! I’ll be trying this recipe!! Oh my gosh this looks amazing. I hear so man that good things about the instant pot, but I dont peronally have one. This recipe looks so simple. I just made crockpot chicken and dumplings last night for dinner! This is similar to what I made last year, it’s so so so delicious. I love soup. Thank you for sharing this great recipe. I am sharing this to my social media if it’s okay? Absolutely! 🙂 Thank you for sharing! This looks wonderful! Perfect for a chilly winter dinner. I just bought an Instant Pot and may need to try this recipe. Thanks!